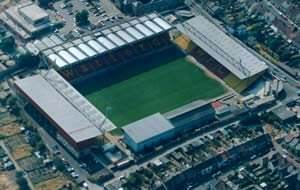 Vicarage road holds 22,000 fans and offers all seating. The away fans view is unobscured by posts etc and sitting towards the rear of the north stand you have a very good view of the pitch. Away teams are normally given approx 2000 tickets. The Stadium is totally covered. Home fans can purchase alcohol in the ground before the game and at half time although you are not allowed to drink whilst in view of the pitch. There is no alcohol available to away fans. The food in the ground is generally poor and has been a source of annoyance for Watford fans for many years. Exit M1 at junction 5 and take third exit off roundabout, A4008 (Stephenson Way), signposted Watford Town Centre. Bear left on dual carriageway, by-passing the roundabout, towards Town Centre. At next roundabout follow signs to Town Centre. Immediately in front of you is the Harlequin Centre. Stay in the middle lane of the three lane carriageway on ring road. After the second set of traffic lights (Watford Springs on your left), move into the left lane and take the turning signposted Hospital and West Watford. First left is Lady Close, Watford Grammar School for Girls' car park (200 spaces at ?2.00). If you carry on to the mini one-way system, bear right and follow signs to Rickmansworth / West Watford A4145, take left hand lane and bear left at traffic lights past Stadium. The Hospital Car Park will appear on your left, this holds 700 spaces at Â£1.50. Exit M1 at junction 5 and take first exit off roundabout, A41 signposted Harrow (then as from North). Exit M25 at junction 21A and join M1 at junction 6. Exit at junction 5 (then as from North). Exit M25 at junction 19 and take third exit off roundabout, A411 (Hempstead Road), signposted Watford. Continue for approximately two miles and at roundabout go straight across (right-hand lane) to next roundabout, then take third exit into Rickmansworth Road. Take second turning on the left into Cassio Road, continue through traffic lights, to Merton Road and straight on to Wiggenhall Road. At traffic lights, turn right into Cardiff Road (then as North). North London Railways - Watford Junction Station (15-20 minutes walk) on a fast train from Euston, or Watford High Street Station (5-10 minutes walk) on a 'slow' train from Euston, stopping at all local stations. By Tube The best route for Vicarage Road is to take the Circle, Hammersmith & City or Bakerloo line to Baker Street and then change for the Metropolitan line and go to Watford, noting that Watford Met is outside the one-day travelcard zones and you'll get a ?10 fine if you don't buy an extension before you get to the station. On matchdays there will almost always be fans heading to the ground in replica kits who you can follow from there on. Alternatively, you can get a taxi from the station. Another route using the underground is to take the Bakerloo line to Harrow and Wealdstone and change for the local British Rail train to Watford High Street. By Bus Vicarage Road (Sunday service: hourly at 23 minutes past the hour; 26 minutes past the hour from Vicarage Road (General Hospital) back to station. There is virtually no street parking around Vicarage Road, as local streets are blocked by the police and side streets fill up very quickly with home traffic. Luckily though, there are two really good places to park at Vicarage Road... The Watford Grammar School for Girls, located on Lady Close, and has around 200 spaces, and the Watford General Hospital, located directly next to the ground, which hold 700 cars. The Harlequin Centre also offers parking, although queues of shoppers leaving the centre can cause delays. The Gade car park is slightly out of town but less congested. M Browne has e-mailed us, and says 'You can no longer park at Watford Grammar School for Girls unless you arrive really early as they reserve most of their spaces for car park season ticket holders. The car park at Watford General Hospital is a nightmare to get out of, at least an hour!! The nearest cash point is the Harlequin centre which is 15 minutes walk from the ground. You're more likely to find more variety in one of the bars in the town centre. There are several, mostly 'theme' pubs now, but maybe the best of the lot would be The Hogs Head, in the High Street under the flyover before the pond. If you are arriving by train at Watford Junction... then try the Flag and Firkin. This is a large pub, and also serves good food. If the weather is good, there is also a nice beer garden. If you are a registered user then you can login, and create your own personal review of Watford Football Club - Vicarage Road. These reviews can be private or public.